25 invitations and envelopes per pack. SKU: invitkiterlyb Categories: Pink Ribbon Day, Pink, Hot Pink, Red, Invitations, Pink, Baby Shower Invitations, Baby Pink, ON SALE! 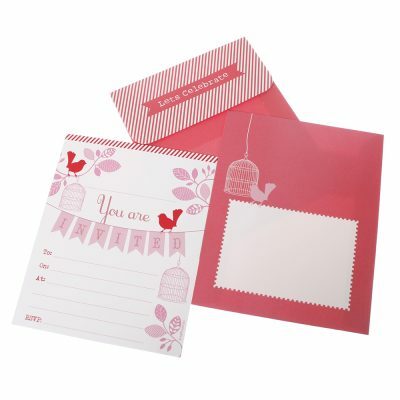 These gorgeous Invitations ~ Early Bird in pink, red and white are great for a whole host of events. We love them for birthday parties of all ages and they are also a popular choice for baby showers too. They are made from thick card and come complete with a stunning coordinating envelope and a self-adhesive magnetic strip for attaching to the back of the invitation. Suitable for many girly themes.